If solicitors were supernatural creatures, what would they be? That was something some friends and I got chatting about the other day. Yes, a slightly odd topic, I agree, but most people end up using a solicitor some time or other in their life - usually when they are buying or selling a home or making a will. The solicitor my family used for exactly those reasons was like something out of Dickens; an extremely elderly man who spoke in precise tones, wore little half-frame glasses and wrote his letters by hand in copperplate script. My husband was convinced he was at least a hundred years old and really some sort of undead, although he was far too sprightly to be a ghost. Our solicitor did a great job - and if he had perhaps unnaturally extended his life by means of some clever deal with the devil that only proved he must be a very good lawyer indeed. Other people had less satisfactory experiences. One person said their solicitor was like a zombie. Communication with them was almost non-existent and they moved so slowly when my friend was trying to sell their flat that the whole thing fell through. Another friend described the solicitor who handled their divorce as promising to be a guardian angel but turning out to be a vampire. While the horror stories exist, most solicitors are in fact perfectly competent at their jobs. When you go to a solicitor to draft legal documents, oversee proceedings or just for advice, you should be able to expect the best from them. If you do feel that a legal representative hasn’t done a good job it is possible to make professional negligence claims again solicitors. One firm that offers that is Redress Law, which offers to fight your cause using its extensive experience in all types of claims against negligent solicitors. If you do have to go to a solicitor to champion your cause, I hope they turn out to be Prince Charming and that you get a fairy tale ending. 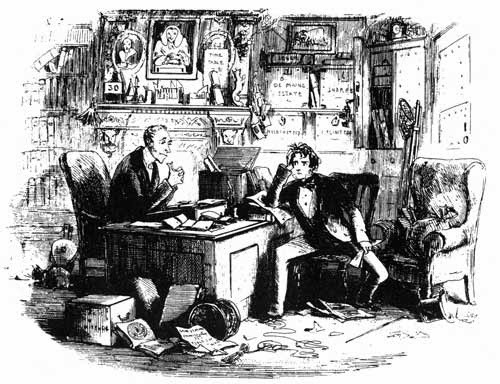 The picture is a copy of an illustration from Dickens' Bleak House: Attorney and Client. It is out of copyright.